Sometimes an event needs a little something extra. 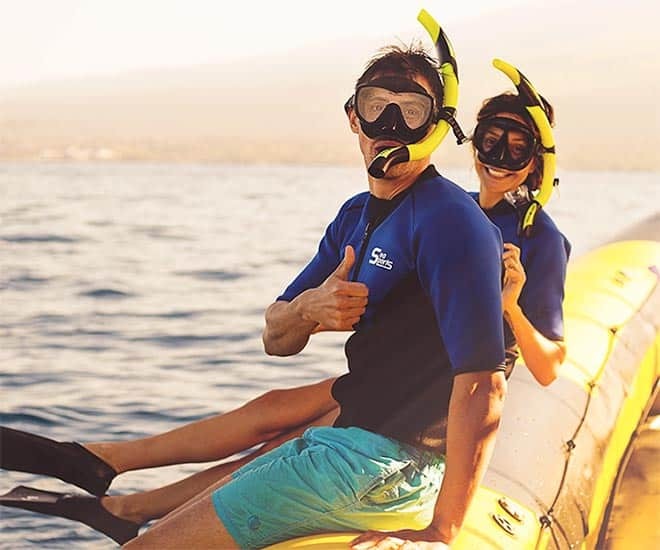 Add a memorable experience to your next wedding, birthday, bachelor(ette) party, or team building retreat with a private snorkel charter. You can customize your own adventure. Just tell us what you envision, and we will help you design your Best Day Ever. To discuss private charter options and pricing, please contact us today. Doug, Trish and Crew is absolutely No Ka Oi! We chartered them for a birthday group and it was by far the best experience ever. Your trip will include snorkel gear, flotation devices, wetsuit tops, jackets, reef safe sunscreen, and depending on the length of the charter, snacks or fully catered meals. If you will be snorkeling, all you really need is a towel and a swimsuit! We recommend you bring an underwater camera, a change of clothes, and cash for a crew gratuity (at your discretion). Please, no spray on sunscreen as it is damaging to the reef and the boat. If you will be cruising at sunset, we recommend bringing a light jacket or sweater for your comfort. Our minimum excursion age is 5 years old and is not intended for pregnant women. Due to the adventurous nature of the ride, please use discretion if you have back or neck injuries or are recovering from a recent surgery. Give us a call, and we’ll help think through your event with you. To discuss private charter options and pricing, please contact us today.